Let’s face it, figuring out age-appropriate materials in middle and high school special education classes for individuals with severe disabilities that are also a match for their developmental skills can be a real challenge. 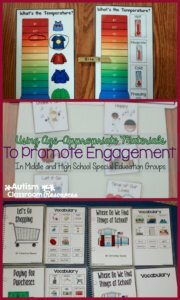 I’ve talked about some strategies that promote engagement in all classroom group activities that can be applied at this age as well. However, today I wanted to focus on the older students and how we can meet their needs while remembering they are middle and high schoolers. 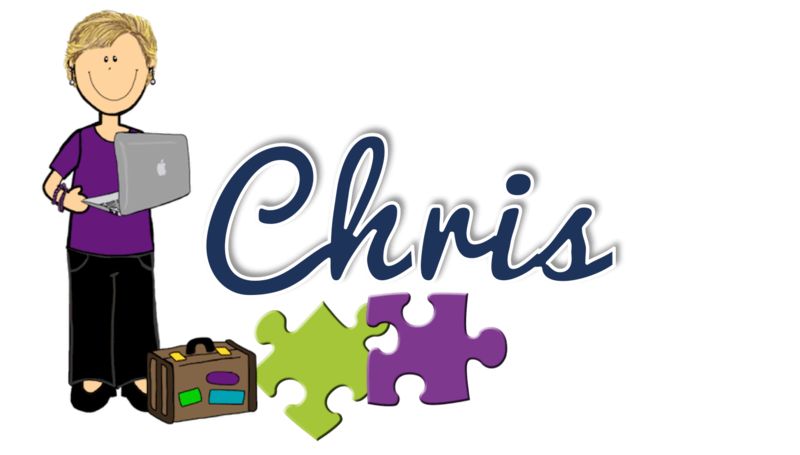 One of the reasons I started making materials for classrooms was because I was tired of walking into so many secondary classrooms that either had no materials or the activities they were doing and creating were preschool activities. Yes, the student’s development, communication and skill level might be like a preschooler’s, but that doesn’t mean we need to treat him/her like a preschooler. I have a friend who used to say something that always struck home with me. 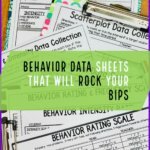 If we use materials and curriculum appropriate for a 5-year-old who is actually 16 years old, we are saying that our goal is to make him the best 5-year-old he can be. That should not be our goal. Our goal should be to help that 16-year-old student to be the most independent and happy 16-year-old he can be. 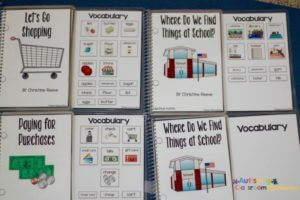 O n the flip side, over my career I’ve seen so many classrooms that are trying to provide age-appropriate materials, but somehow age-appropriate materials to some people means boring materials that are not well-organized, that are highly repetitive and just plain dull. I don’t know about you, but that’s not what my work place looks like. (Actually at the moment my workplace looks like a mess, but that’s a different story). I’m an adult (how did that happen?) but I still like things to be colorful and engaging. What I don’t want is for pictures that represent me as a student to be babyish and look much younger than me. I can’t identify with that. I love 5-year-olds, but I know they are not like me. 🙂 I don’t want people to walk into my work space and say, “This looks like a baby’s room.” But that doesn’t mean that I don’t like colorful books and materials, interesting and engaging activities, listening to music, or dancing. So, how do we develop activities that are meaningful and age-appropriate but still adapted for the developmental level of our students? Here are some ideas for group activities that are designed to build functional skills, encourage communication, integrate choice into the routines, and still focus on age-appropriate activities. 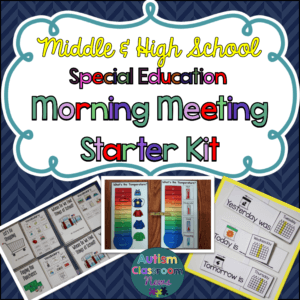 I’m going to focus on some specific common morning meeting activities that can be made age appropriate and address functional skills. One of the most common activities we do in a morning meeting is reviewing the calendar. Clearly, it may not be age-appropriate to sing the Days of the Week song. However, using a calendar is a huge functional skill. I use one everyday and I’ll bet you do too. Knowing how a calendar works, predicting what dates something will occur, planning on a calendar, etc. are all skills that aid independence. For some of students with significant delays, understanding what days we come to school and what days we stay home, or what days specific activities like community outings will occur, might be part of that process. 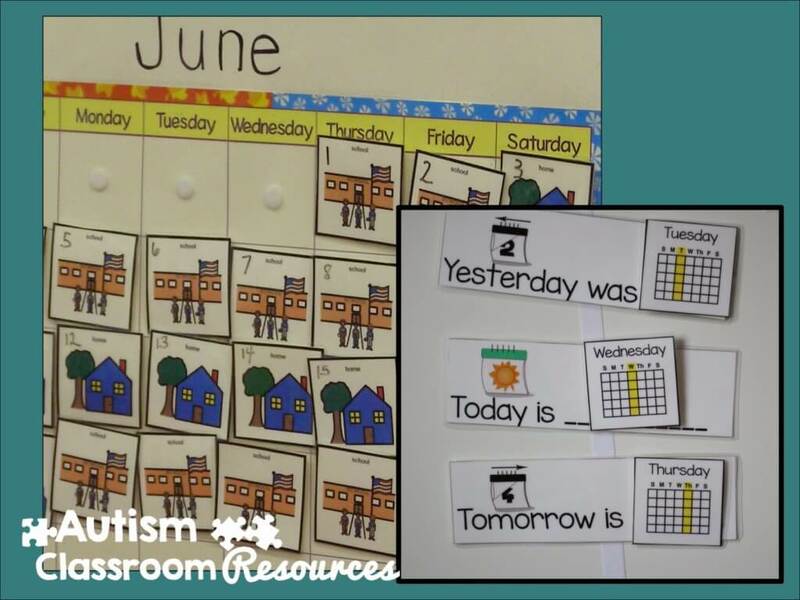 So you might use the same type of calendar shown here with numbers and home, school, community and special event pictures to begin to understand the use of the calendar. So for instance, the calendar in my secondary morning meeting set up kit is set up in the same way as the one in my preschool and elementary set. They both include pictures of home and school with numbers, similar to the one above. They both include days of the week and yesterday, today, and tomorrow to help students of all ages learn to use the calendar. Weather is another activity that is highly functional but can be very abstract. I watch the weather on the news and more often I look it up on the internet. For young kids, we have the students look out the window and describe what they see. As we get older, we start to use weather information to decide what to wear, what to pack for a trip etc. This is the same type of information that we can teach our students, but we need to make the connection more concrete for them. 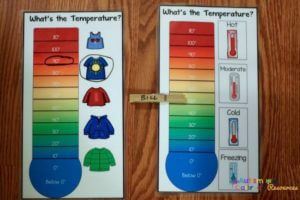 In the secondary morning meeting start up kit, for instance, I created a couple of thermometers that allow students to look up the temperature in the weather report, and record it on the thermometer with a dry erase pen or you could use clothespins with their names. You could have the students identify the current temperature by using a thermometer and then predict, based on the weather forecast, what the temperature will be later in the day. Each student could use his or her own clothespin or a different colored paperclip. Then you can check at the end of the day and see if they were correct. I equated the temperature to clothing and to common weather terms (e.g., freezing, warm) that they might see on the weather forecast. My WeatherKids activity is also a good activity to use during this activity to have the students dress a figure for the day. Students who are higher might keep a weather journal and record the weather forecast and outcome each day as part of a science project. In the future, I will be making some morning meeting activities for students who can use more pen-paper activities to practice these skills. Making choices is still a functional skill for communication for our students. 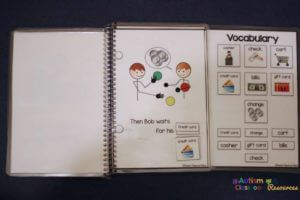 We can expand it by having them tell us their preferences in sentences, using their augmentative communication, or even writing it down. 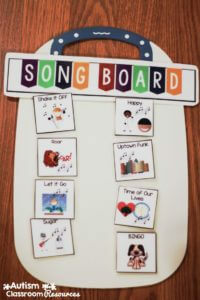 Reading and listening to music are certainly age-appropriate activities–the question that directs it being age-appropriate is which books and songs they choose from. Wheels on the Bus wouldn’t be a good choice for a high school student. Imagine what the peers of the high school student might think about the choices offered and whether you want them to view your students as equals or preschoolers they have to care for. In addition, we don’t want our students to be embarrassed for their peers to come visit their classroom or sit in on their group activities. So, I usually choose music that is popular, always keeping an eye/ear out for appropriate lyrics. Kidz Bop does a great job of recreating a lot of the popular songs with appropriate lyrics and I used them as a guide for the morning meeting starter kit in the picture. These are all songs that their peers will hear and many of them love them. With books, it’s a little harder. 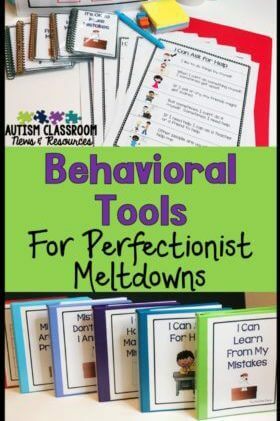 I really love using adapted books for interaction and wanted to make some books that addressed functional skills while still had interaction within them. Morning meeting is a good time to read them as a group, but I also use them in direct instruction and independent work once the student has mastered them. Many times the students in morning meeting have a wide variety of skills so I like books that include words and picture supports. I like these types of books because they encourage comprehension and include interaction so the students are more engaged. I give them each a picture or word and they have to listen to when it belongs in the story. I also can then use the pictures and/or words to have them sequence the story. I created the shopping activity around making an apple type of dessert we often make in the fall during cooking. (There are 2 of the same one because I couldn’t decide whether students would know to find the picture of a student putting his books in his locker to a picture of the locker itself, reading a book to the library, etc. 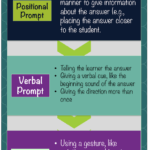 So I made both versions so you can decide what works for your students. These books definitely do look different than the typical kids’ books their age. Consequently if I have typical peers come in for group, I might use these at a different time. However, the topics are appropriate and they don’t look like younger children’s book so there isn’t an immediate stigma attached to them (I hope). So, there are a number of ways that you can boost the age-appropriateness of morning group activities, but these are 3 examples that might be helpful. When I do exercise time I might do a circuit where the students move through stations. My jobs we assign at morning meeting are more “jobs” than “helpers” so the students are learning actual jobs and responsibilities for their classroom (e.g., delivering mail, making copies, watering the garden). If you are interested in the secondary morning meeting set, you can find them here or by clicking on the cover below. 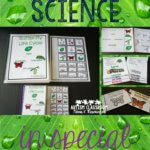 The functional interactive books shown above are part of the start-up kit but are also sold separately HERE. I will be making add-on packs to the starter kit and more functional books, so if you have requests, let me know. What are your go-to age-appropriate group activities for middle and high school? Thanks Rae! I’m glad it was helpful!